Microsoft recently announced that Red Dead Redemption would be playable on the Xbox One via backwards compatibility on Friday. 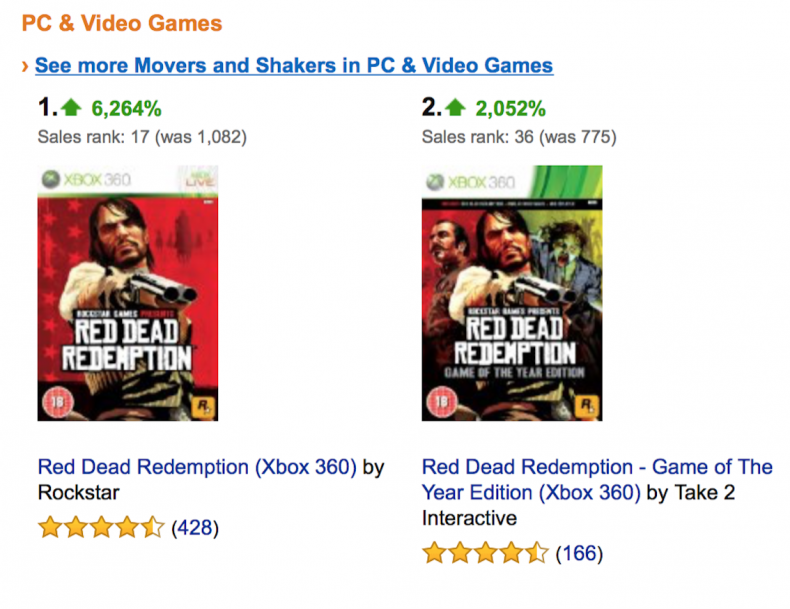 Within hours of this announcement, sales of the original game, and its Game of the Year version soared on Amazon. According to Amazon UK, and shown in full in the picture above, both games have skyrockted in sales rank since the announcement. This is curious for numerous reasons. One, it may make some wonder why this is happening now, and two, it makes one wonder why some aren’t simply going to get the digital version that Microsoft has stated will be available on Friday as well. Regardless, it appears to be a great time to be a Red Dead Redemption fan.